So last meeting we held the voting for our t-shirt design! It was a long and difficult battle, and if you were near the end of the voting line, they had run out of cookies. So sad… Nevertheless, the winning design was this one, created by member Jo Furmanek. Congratulations! We’ll have more info about club t-shirts in the upcoming meetings. 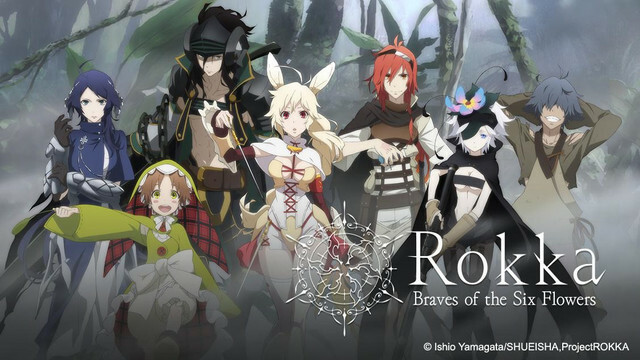 For member’s choice, we watched Rokka no Yuusha, an anime about several heroes called Braves that are summoned to defeat the Evil God. After our short break, we watched episodes 7 and 8 of Death Parade and Assassination Classroom. Getting close to the end of our first half-season! Last meeting was pretty smooth. No major technical problems encountered. We had a panel on SwampCon! We talked about this year’s theme, main events, and how you can help out. We’ll be having our SwampCon general body meeting on 9/23, 7:30 in CSE 222 (the same room we have our club meetings in). Please attend if you’d be interested in becoming a staff member (like serving on the design team), a volunteer or volunteer captain, a chair member on our committee, or even if you just want to know more about SwampCon. For our member’s choice we saw Hitman Reborn! It looked innocuous enough, but I’m sure it will take a darker turn in which either a) the main character will realize he has to kill people as a mafia boss and face an identity crisis, or b) Reborn will reveal his past as some sort of twice-birthed monstrous creation. After a short break, we watched episodes 5 and 6 of Death Parade and Assassination Classroom. We opened up with a dual panel covering Maid Cafe by Robert and the Hologram Vocaloid Concert by Elias and Scott. If you’d like any information about either of these programs, you can ask them through Facebook. Maid Cafe will be having their first meeting this Sunday! We started our member’s choice, Ore Monogatari (My Love Story), an interesting twist on the romantic comedy genre. However, some issues arose with UF’s computers, and we basically got a Blue Screen of Death (twice), which was most unfortunate. Luckily, we were able to play the rest of the show through one of our members’ laptops. After that, we showed our weekly episodes from Death Parade and Assassination Classroom. See you next Thursday! If you came out to our first meeting last night, you’re amazing! We had a great time playing “guess the character” in which everyone thought Robert was talking about Log Horizon, but it was actually I, Dio Brando. Anyway, we introduced the new officers and went over the club rules, guidelines, and events. Then we watched an episode of Gintama and the profound video animation Death Billiards. After a short break, we watched the first two episodes of Death Parade, the anime continuation of Death Billiards, and Assassination Classroom. And don’t forget about the t-shirt design contest! Submit your own designs for our club t-shirt to gatoranime@gmail.com by 12 AM on 9/17 and we’ll have a club vote on which design we’ll use for the 2015-2016 year! Hey there! Make sure to come out to our meeting tomorrow: Thursday, September 3rd! We’ll be meeting in the Computer Science & Engineering Building, room 222 (CSE 222) at 7:00 PM. We’ll start off with an introductory slideshow about the club and then move on to our member’s choice and a showing of the Death Billiards OVA (a prequel to our first half-season anime). We will then have a 30 minute break and at 9:10, begin watching the first two episodes of our half season (Death Parade) and full season (Assassination Classroom) anime!